The Botswana wilderness is renowned for its unusual animal behavior, none more so than the pride of Lions in the Savute region of Chobe National Park that learned to kill adult Elephants. The Elephant-killing Lion pride is well documented on film and image but as yet there is no definitive explanation as to how the behavior came about. Theories range from an ancient memory stirring of the time of the mammoth-killing cats to a human accident of setting up artificial waterholes in the area when the Savuti Channel dried up. 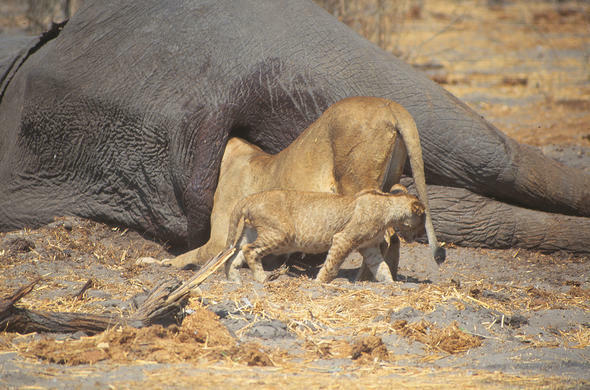 My first experience of Savuti Lions feeding on Elephants was a sighting of the famous Maomi's Pride feeding on a very small individual. 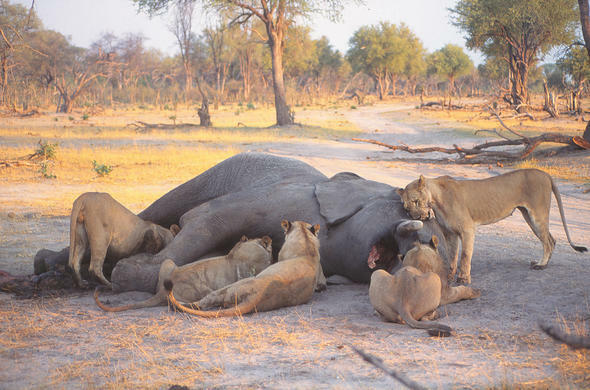 My personal view at the time was that hyenas had killed the elephant and the pride had taken over the carcass. A two-day standoff ensued between the five Lions and 21 Hyenas until the sheer weight of numbers in favour of the Hyenas forced the Lions off the carcass. 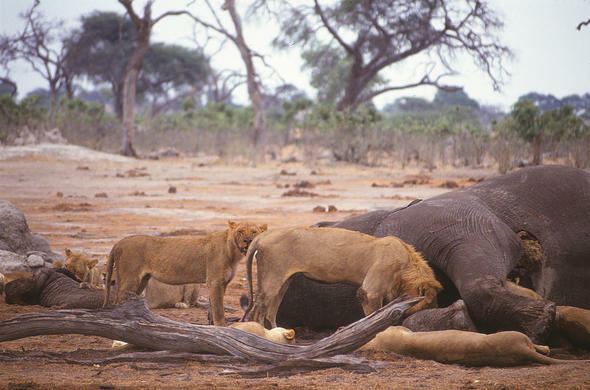 Over the years I saw many Elephant carcasses in Savuti been fed on by Lions. Most of these Elephants had died of natural causes. One of the more memorable incidents was when an old bull Elephant had fallen and was unable to get up. Lions began feeding on its rear end amid panicked attempts at getting up from the old bull. It was a long time before the old bull died. Could this have stirred something in the Lions - a realization that they could control an adult Elephant? 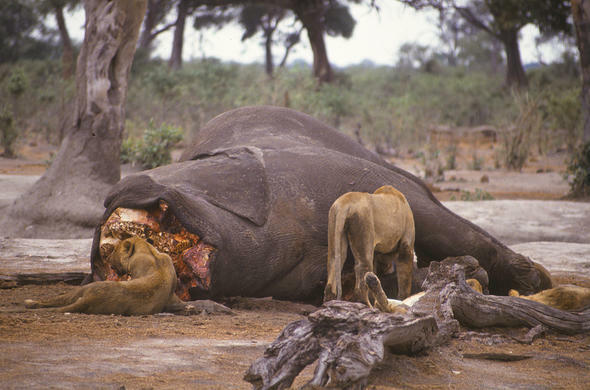 Over the years I saw many Elephant carcasses in Savuti been fed on by Lions. Most of these Elephants had died of natural causes. One of the more memorable incidents was when an old bull Elephant had fallen and was unable to get up. Lions began feeding on its rear end amid panicked attempts at getting up from the old bull. It was a long time before the old bull died. Could this have stirred something in the Lions - a realization that they could control an adult Elephant? The Savuti Channel flows from the Linyanti water system on the Botswana Namibia border, through arid wilderness, until it empties into the Savute Marsh on the edge of the Mababe Depression in the Chobe National Park. 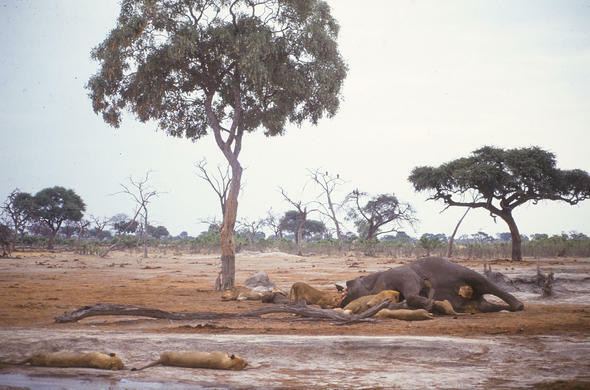 The channel dried up in 1981 and the as a result the Savute Marsh also dried up but artificial waterholes provided a lifeline for the animals. It was in this environment that the Lion pride, counted at over 30 individuals, specialized in killing elephants. In 2008 the Savuti Channel began to flow again after more than 25 years and by 2009 the water had reached the Savute Marsh. The whole eco-system of changed dramatically overnight - and the Lion pride split up. Today there are still incidents of one of the prides hunting Elephants but not nearly as regularly as in the past when the Savute was dry. For visitors wanting to experience the legend of the Elephant killing Lions then a visit to Savute is highly recommended, even taking into account that the behavior is seldom recorded today. The Savute of today is still a place that echoes an Africa that may never be again, and the wildlife is spectacular.